Science and art are mixing it up in equal measure in the Illawarra. Affectionately called the Nick Head project, the Red Point Artists Association is collaborating with myself, ABC Illawarra and the University of Wollongong’s Centre for Archaeological Science and Intelligent Polymer Research Institute. Together we plan we are in the process of deconstructing, drawing and scientifically analysing the face of local ABC Radio Mornings presenter, Nick Rheinberger, which will all culminate during National Science Week. The project involves first estimating Nick’s skull by reverse-engineering the methods I typically apply in my research, which is estimating the facial appearance of forensic and archaeological remains. A public science ‘facial deconstruction’ is something I’ve wanted to do for a while, but it needs the right person to make it happen. It’s a pretty aggressive thing to do to someone, to strip them down to the bones of their face – even though it’s only an estimation. But as the time-lapse clip below shows, Nick seems to be coping with the process very well. Facial deconstructionIn a world first, Nick Rheinberger is getting his head “deconstructed”. Facial Anthropologist Susan Hayes normally takes ancient skulls and puts faces on them, but as a teaching aid, she’s taking Nick’s head and turning it into a digital skull. The first part of the project is a series of hi-resolution photos of Nick’s completely still and level head. Take a look at this time lapse. Nick Rheinberger gets his head scannedIn a world first, Nick Rheinberger gets his head deconstructed back to the skull (non-invasively) by staff from the UOW: University of Wollongong, Australia to create a teaching aid for artists and anthropology students. This is the second part of the process. He had an electronic scan of his head, which will be turned into a 3D printed bust. Contrary to his request, a large replica will not be placed at the entrance to the UOW Innovation Campus. The man in charge of the scan was Christopher Richards, a PhD student at Intelligent Polymer Research institute. 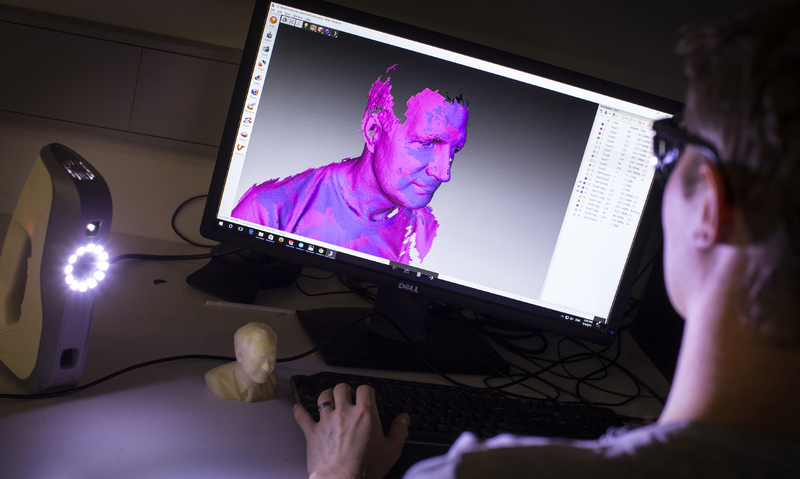 The scan, which was undertaken by IPRI PhD student Christopher Richards, will provide the orthogonal anthropometric data for estimating the 2D ‘skull’, and the 3D print will also be used to scientifically test what happens during the art of portraiture. In July, a group of Red Point artists will use this information to create portraits of Nick. These will be displayed in the Red Point Artists Association Workshop Gallery during National Science Week. In addition, at the opening on Saturday 12 August, people visiting the Gallery will be asked to determine how well they think each portrait resembles Nick. With judges including Nick, his’s family and friends as well as visitors, this data will be used as part of a statistical analysis to determine how the portraits have changed the shapes of Nick’s face and features, and how these changes affect what is judged to be a ‘good’ likeness. While there’s anecdotal evidence that highly accurate portraits are not judged well, this concept has never been tested. So, as well as being a National Science Week event, it’s also a real research project, with all participants – including both the portrait artists and the scientists – co-authors on a research paper. The following day, there will be a workshop where interested members of the general public will be guided through reconstructing Nick’s face from the estimated 2D skull to the skin. Along the way, participants – and visitors who will be welcome to come and see what’s going on – will learn how Nick’s head and face fits with what we know about human evolution and modern cranio-facial variation – and where his particular facial features are very much unique to himself. Dr Susan Hayes is researcher with the University of Wollongong’s Centre for Archaeological Science, specialising in estimating facial appearance from the skull. She has undertaken human identification for police agencies across Australia and has recently returned from three years undertaking research with archaeological and palaeontological remains across Southeast Asia.